We just learned that we will be building another set of sails for a square rigged early 17th century replica ship. This will be our second full suit of square sails over the last ten months. We will be ordering materials soon, getting started sometime in late May, and working on the project over the summer. Stop by the loft sometime and see how sails were made 400 years ago! I am very pleased to report that we have finished up the repair work on the Eagle sails. The job turned out to be a bit more involved than we originally thought but went smoothly. We replaced all of the edge ropes on four of sails, and replaced the sun covers on all five. We also made a number of minor repairs. The project was a lot of fun. the new sewing machine is really proving its worth. These big sails are almost easy to sew with it. We are now getting caught up on our regularly scheduled work that is all coming due as the weather warms up. Lance is on his way to pick up five sails that we will be repairing for the USCGC Eagle. 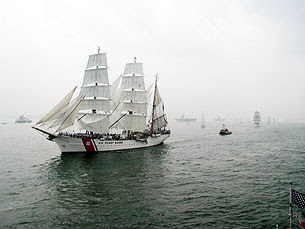 The Eagle is a 295' Barque that is used as a training vessel for Coast Guard officers. She carries about 21,000 square feet of sail. We are repairing five of the sails including the forecourse which is one of the largest sails she carries. Lance left early this morning to go to New Londoin CT which is a 7-9 hour drive each way. He should be back sometime tomorrow, although I wouldn't be surprised if he pulled an up and back trip in one day. We will have the sails on the floor Wednesday. If you are in the area and want to see some interesting sails stop by the loft during the next couple of weeks. I'll post more once we get started on the repairs. We had to take last week off from square sails to build a couple of laminate race sails, a cruising spinnaker, and a boom furling main. But we have pushed most of that to the side to put in a good chunk of time on the square sails. Lance and Justin are getting more time on the sails than I am, but in between sail sale calls I have been able to sew ropes, install some cringles and re-cut the mizzen bonnet. We are actually in the home stretch on the first three sails. Things are going much more quickly as we have all become competent at roping and the other basics of making these sails. I got a shot today of Justin in the act of worming, parcelling, and serving a clew and Lance running the computer driven cutting table. It is amazing to see how much sailmaking has changed in the last 400 years! Not only have the processes changed but the basic structural design of sails has changed. Square sails are essentially a membrane that floats inside a rope frame. The roping around the edges provides much of the structural strength of the sail as well as providing the 3D shape. When sewing the ropes we gather the cloth so that when the sail is hoisted and the edges stretched the cloth is stretched less and takes a shape. Structurally the sail "membrane" is mostly a single layer with a tabling around the edges and a a double layer along the leeches. These reinforced areas primarily provide a transition from the membrane to the edge rope which carries the heavy loads. In modern sailmaking the membrane of the sail not only carries the loads but also provides the shape though broadseaming and luff curve. The corners of a modern sail are built up with multiple layers of cloth to transition the loads from the corners into the body of the membrane. The leech and foot edges on a modern sail are merely finish details and the luff is reinforced enough to interface the sail with the spars. Shape is imparted on a modern sail membrane by attaching two curved edges(or a curved luff to a straight mast) to create a 3D shape. All of the seams between panels and the luffs of modern sails are shaped this way. the computer has made 3D shape easily repeatable and sails have become very consistent in shape. One of the great things about this classic sailmaking project is watching the shape being created inch by inch by the deliberate use of needle and thread by human hands. And today was a very good day as the hands in this loft kept all blood on the inside! The first thing I had to do today is buy band-aids. For some reason these guys keep poking themselves and I don't want blood all over the sails. Stuart bleeds more than the others each time he breaks open but the other two tend to poke themselves more often so its probably a wash. Anyway the rope dried and the roping got underway today. Since I am paranoid that I have grossly underestimated this project I am scrambling to sell sails and letting the other guys do the heavy lifting today. Lance and Justin did a really nice job roping the sprits'l today and will be continuing work on it and the mizzen bonnet tomorrow. Tomorrow we will get to more places on the sails that will have cringles and splices. It should be fun. Hopefully we can reduce the bleeding tomorrow. The left hand picture shows the sail and rope strung up together and being sewn together. The one on the right is a close-up of Lance sewing the rope. He is wearing a palm and a glove. The palm is used to push the needle through and the glove provides extra grip for pulling the needle on the backside. "Lance, there's a huge stain on this sail", "Lance, the boat ran aground", "Lance, can you help me get rid of this body". It never ends. 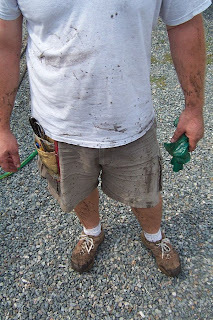 Jerry (our fearless leader) comes in this morning and says "what do you say we dye some rope". Our concerns of whether we're dressed for this or not were met with the typical "you worry too much"; and within the hour he'd rigged up a system using state of the art equipment for the task. The process consisted of a 50 gallon drum and a plastic shipping tube left over from an order of battens. 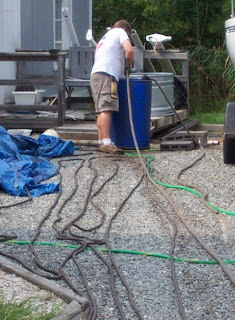 The tube was cut down to 6 feet, then filled with the paint/dye mixture and placed inside the 50 gallon drum. 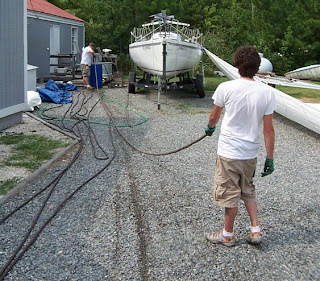 One person fed the rope into the tube, another pulled it out the other side while squeeging off the excess, and a third pulled the slack of the rope and laid it out for drying. The process took about 3 hours and we ended up doing two runs of over 400 feet. It turned out beautiful. Now we're just hoping it doesn't rain before the lines dry as one of our technical advisors sent an email telling us that if it gets wet, it can take days to dry. We spent the day friday sewing grommets. In modern sailmakaing few people sew grommets at all. We use two-part nickel plated brass grommets that are quickly set by first punching a hole and then applying three good strikes to a forming die. Hand sewn grommets are made-up using a round formed piece of line that is sewn to the sail around a punched hole. The liner is made of 1/4" three strand line that is spliced into a circle. The thread is passed alternatly through the hole and then passed over the liner and through the sailcloth in a circle about a half inch larger then the hole. At left is a picture of the top two grommets on the luff of the mizzen. The grommets are sewn along the head of all of the sails and along the foot of any sail that will use a bonnet. So we are sewing grommets across the head of both the mizzen and the sprits'l and along the foot of the mizzen. On these sails we are sewing two 5/8" grommets per panel. The next step will be to rope the edges. The rope is being made now and is scheduled to be here this week. It will need to be dyed before it is used so it'll probably be another week before we resume work on these sails. In the mean time the crew will be practicing the neccesary splices and knots and catching up on modern sailmaking projects.